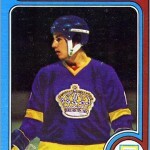 O-Pee-Chee always tried to make their hockey cards as up-to-date as possible back in the 1970s and 1980s.. When a player was traded, the card company would communicate this fact on the front of the card. Sometimes they would have the photograph altered, and sometimes they’d add a line of text explaining the player’s whereabouts. 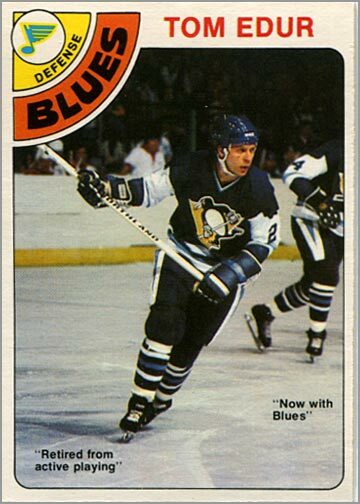 On the 1978-79 O-Pee-Chee card of Tom Edur, it gave two contradictory explanations of the former Penguin’s current status. 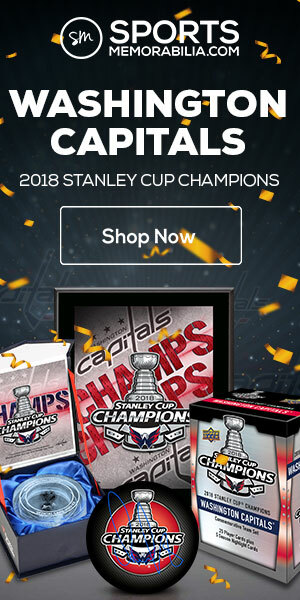 Near the bottom-right corner of the card, it states “Now with Blues.” This is reinforced by the fact that the Pittsburgh Penguins logo and team name have been replaced by that of the St. Louis Blues. What happened? Did their proofreader call in sick that day? 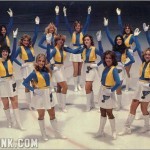 Edur never played for the Blues. 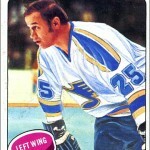 In fact, he was never traded to or signed by the Blues; he had absolutely nothing to do with that team. Whoever told O-Pee-Chee that Edur was with the Blues was probably the same person who told them about the Jacques Lemaire “trade” a few years earlier. 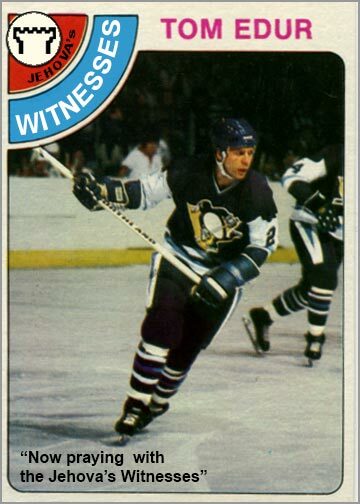 But Edur did retire from “active playing” — as opposed to passive playing?– after the 1977-78 season so that he could dedicate his life to being a Jehova’s Witness. 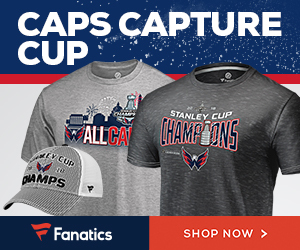 Pro hockey was not going to stand in the way of his relationship with God. The Penguins tried working out a deal with Edur that would have excused him from playing games on Sunday, which was pretty considerate. Do you think the Maple Leafs or Black Hawks, circa 1978, would have made a similar accommodation? Regardless, Edur declined the Penguins’ offer, seeing religion as an everyday commitment. A year later, Edur could have had a second chance in the NHL. 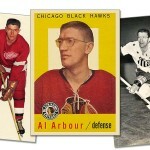 The Edmonton Oilers selected him in the intra-league draft when the NHL and WHA merged. 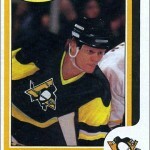 Maybe this was God’s way of telling Edur he should play hockey and win a few championships. And yet again, Edur picked religion over hockey. 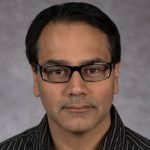 Hi Sal, I’m one of Jehovah’s Witnesses (a lot of you probably didn’t know that) but I never knew that a hockey player had ever retired to get baptized as a JW! 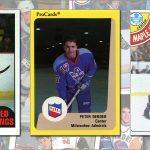 That’s crazy, I like the hockey card, BUT get the name right ;). I like the slogan and the Watchtower symbol on the top, nice attention to detail. Thanks for the read bud! Yeah, I haven’t heard of a player retiring from hockey for religious reasons, either. At first, I was intrigued that the card said he was both traded and retired. Also, I’ve fixed the “team name” in the upper left corner. Haha thanks…you know what, I might just start a player collection of this guy, you’ve sparked my interest! He was also featured on 2 collectible Coca-Cola cans (as a member of the Rockies) and on a postcard issued by the Cleveland Crusaders. So, that’s 4 normal cards, 2 team-issue cards and 2 soda cans. Might be enough of a challenge to put together the definitive Tom Edur collection.